Wynter Moorehawke travels alone and unprotected in bandit-infested forests, searching for the rebel Prince Alberon. But many enemies are lurking in the shadows. It seems that every tyrant and zealot who has ever threatened the Kingdom is sending emissaries to meet Alberon. Wynter becomes increasingly nervous of the prince’s intentions. She is overjoyed when Razi and Christopher re-appear, but where old friends go, old enemies soon follow and Wynter finds herself confronted with the infamous Wolves – the Loups-Garous. It is to Christopher’s adopted people, the Merron, that Wynter and Razi must now turn for sanctuary. But the Merron have sided with their mortal enemy, Marguerite Shirken. What is behind these strange alliances and is Alberon at the centre of it all? Ireland’s answer to J.K. Rowling … at the forefront of Irish fantasy writing. This is a book to be read, reread and treasured. Compelling and complex, romantic and suspenseful, populated by memorable characters and intricately detailed, this impressive middle volume will leave readers demanding the conclusion. 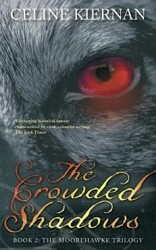 Irish author Celine Kiernan is back with Book 2 of her excellent Moorehawke trilogy, The Crowded Shadows, a cracking theatrical historical fantasy set in medieval Europe.